The boss just ordered 3 bottles for the super comp dragster. Here is the new bottle valve, anodized billet aluminum: Maybe some of you have seen it already, but I thought I would show everyone. What is the advantage, higher flow? 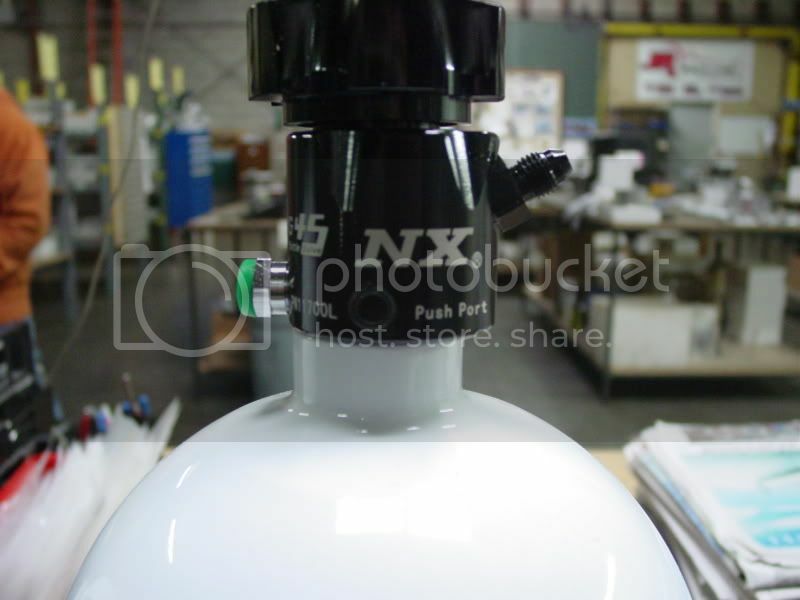 It also has some bottle side ports so you no longer need to "know" someone at N/X to get a "pro-fitting". Nitrous Express Lightning 45 and DF5 bottle valves feature a direct flow path which eliminates those power robbing gaseous bubbles. The result is more horsepower! The Lightning 45 will outflow any competitors valve on the market today by a factor of four and is recommended for all nitrous systems up to 900 nitrous horsepower. The DF 5, which is equipped with a .500 orifice and a direct flow, straight through design, is capable of flowing over 2,000 nitrous horsepower! What plug to run on the bottle!